This easter weekend, VATPAC concludes it's Iron Mic attempt at Sydney. VFR Operations flies out and returns to Sydney Bankstown to add some GA traffic to the weekend's mix. Aircraft : Single Engine Piston such as Cessna 172 or similar capable of 105 to 125 kias. Navigation : Unless pilots are visually familiar with this area, the accompanying GPS Flightplan is recommended. GPS Flightplan is available for FSX, FS9 and X-Plan FMS and also provided is the original Plan-G flightplan for those that find this useful all enclosed within a Zip archive. Bankstown is a general aviation class D aerodrome and is located in close proximity to Sydney International Airport and RAAF Airbase Richmond. 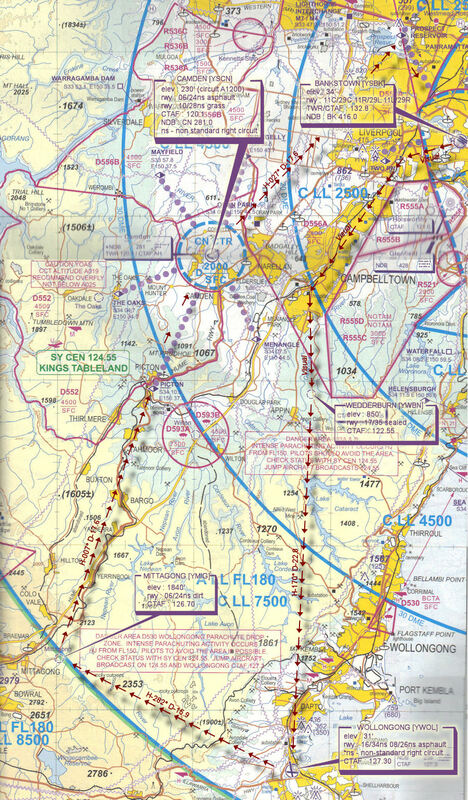 An excellent source of information for Bankstown VFR operations inbound and outbound can be found in CASA's "Ontrack" Online Reference Resource. Pilots unfamiliar with Bankstown Operations are encouraged to visit the site and review available information prior to operating within Bankstown airspace. Inbound reporting point for Camden. If TWR active set transponder 3000 and Call "CAMDEN TOWER [AIRCRAFT TYPE][CALLSIGN] Picton A1700 RECEIVED [ATIS ID] INBOUND"
Inbound reporting point for Bankstown. If TWR active set transponder 3000 and Call "BANKSTOWN TOWER [AIRCRAFT TYPE][CALLSIGN] Prospect Reservoir A1500 RECEIVED [ATIS ID] INBOUND"
Hello all, I have made a vPilot flight-plan for this event. To load it, you must be connected to the network; click "File Flight Plan"; click "Load..."; then locate the downloaded file I have attached. I believe this would be a good addition to the event as quite often supervisors are messaging pilots to file flightplans. If you require any help loading the flight plan or any questions about it, don't hesitate to contact me.